Florence is 17 years old, and she is determined that she will do things and go places. But for the last few years, there’s been something getting in her way: her period. It’s not just boys who are the problem. In Florence’s rural community on the island of Tanna in southern Vanuatu, traditional beliefs run deep, and menstruation is considered unclean. Menstruating women are not allowed to touch the family’s food or even the dishes and they are expected to keep away from other people, sometimes even told to sleep outside the house. Talking about menstruation is also taboo – mothers who have spent a lifetime believing it is dirty don’t discuss menstruation with their young daughters, or even fully understand what’s happening themselves. Not knowing when to expect a period is especially problematic when sanitary pads are expensive and hard to come by. 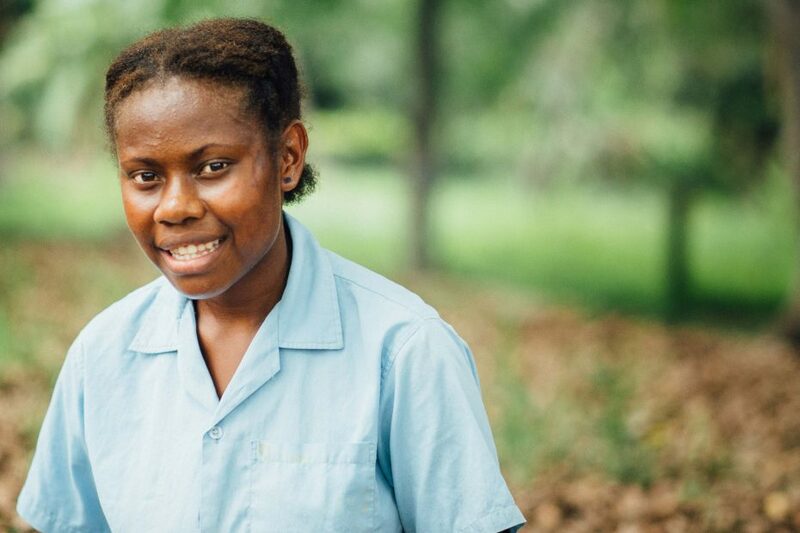 Because of all these factors and fears, many girls like Florence choose not to go to school when they have their period. In fact almost three quarters of girls in Tanna miss up to three days of school when they have their period. Those missed days add up and it’s easy to fall behind, and harder to stick with school at all. Many girls drop out, and many grow into women with less education, less opportunity, and less say in their communities. CARE is changing this by helping girls take ownership of their future through school education programs for boys and girls, and the distribution of Hygiene kits, which contain washable and reusable sanitary pads, underwear, soap, laundry detergent and a bucket. Providing the girls with these materials, and teaching them about their usage gives girls the confidence to go to school knowing that they won’t be embarrassed by their periods, and the freedom to not worry about how to buy the next packet of disposable pads. The kits are given out in special girls-only sessions at school that give girls the chance to learn about their bodies and the menstrual cycle and to ask the questions they aren’t able to ask anywhere else. The hygiene kits and the classes are making a world of difference for girls like Florence. You can be a part of the solution by contributing to our crowdfunding campaign. I saw your video about the sanitary pads. I'm working on a project very much like this in Guatemala. Such a big problem ghe or girl's and women world wide. I'm wondering where you got your design for the pad. Are you willing to share? Please continue to advocate for girl's of all ages. This is a common challenge in many countries not only because of cultural beliefs and lack of education, but also the cost of, and access to, sanitary products. All the best, CARE Australia. I can't believe that this is happening in today's times. So sad! There is some good news to come from this Linda - you can help keep 540 girls in school as well as provide education courses for boys and girls to help combat taboos around menstruation. Donate to our crowdfunding campaign here.